On the left here is St. Dunstan's Church, housing the head of Sir Thomas More, that Man for All Seasons. The head was recovered by Margaret Roper, his daughter, from a spike on London Bridge and brought to its last resting place here in 1535. Straight ahead is the brick building that was Pointer's Hotel, but has been converted to flats in the winter of 2005. On its right is the road out to Whitstable and the north Kent Coast. 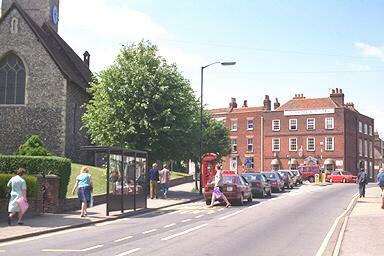 The road in front of Pointer's Hotel is known as the London Road and was the start of the main road from Canterbury to London.